I've been approached by BerryLook, an affordable online fashion store, to promote their website and let you know which products I like. BerryLook offers cheap online shoes and they have everything from flats, heels, boots and sandals. They also offer free shipping on orders over £58 and there's currently a 5% off code which is SALE5. BerryLook has lots of fashion tops for women as well as other items like menswear and accessories. 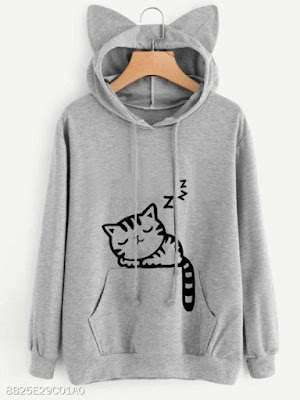 Now as you know I'm a crazy cat lady and I love the look of this hoodie especially with the ears on the hood, and it's available in 4 colours. BerryLook is a global online store that delivers the latest fashion apparel. They have dresses, tops, bottoms and swimwear for girls and ladies. Thousands of products in different styles are waiting for you!